Blake is the Franzenfam comedian. Knock Knock jokes seem to be the favorite at the moment. He often wakes with one on his mind and ready to share. This would not be a problem if he wasn't our early riser. I enjoy a good laugh but don't find much very funny at 6 a.m.
Blake's material is not limited to Knock Knock jokes or to the walls of the Franzenfam home. One never knows when Mr. Funny might strike. The other day we stopped for a quick Chow Mien at a local Chinese restaurant. It was a nice day thus our desire to sit outside. With limited outdoor seating Tori and I sat at one table and Blake and Skyler at another a short distance from our table (Rich was not with us). "Hey Mom, do I have something on my nose, it feels really funny?" Apparently Mr. 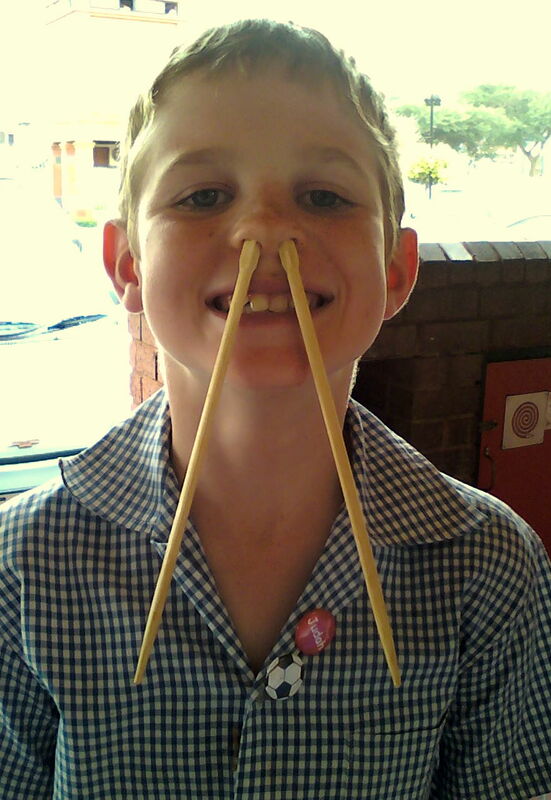 Funny could not resist the urge to incorporate chopsticks into his new act. The restaurant patrons didn't seem to appreciate his humor but admittedly I had a bit of a chuckle...followed by a picture and then of course a stern, "Ok get those out of your nose right now". So who's the "Mr. Funny" in your family and what's his/her latest "joke". Please share...after all laughter doeth good like a medicine. One of my favorites is very funny to some but not so funny to others. I first heard it back in the 40's yipe! Oh and how did I know he was going to send that - yikes.